China's 'One Belt One Road' Initiative and the Future of Chinese Steel - System Seals Inc.
China’s ‘One Belt One Road” (OBOR) initiative is starting to take shape and looks to have a powerful impact on the Asian steel markets for the next several years. This initiative is not necessarily ‘new’, but has been getting a lot of attention as of late, as China seeks to gain more of a leadership role in both regional and global trade. With America leaving the Trans-Pacific Partnership (TPP) earlier this year, the OBOR looks to become the main trade partner in Asia. The OBOR initiative seeks to rebuild the Silk Road trade routes of old when China was one of the world’s largest trading superpowers. There are two components to this potential new trade route. The “belt” is the physical road, which would stretch from the Eastern coast of China, through Europe, ending somewhere in Scandinavia. The “road” is the maritime trade route that connects ports in China all the way to Venice. This route could potentially offer access to 65% of the world’s population, 25% of all goods and services moved worldwide, and approximately 33% of the world’s GDP. It is anticipated that the building of the route alone will result in a 5% increase in demand for Chinese made steel per year (or 20% by 2020). The Chinese government is now asking its steel makers to invest in plants located along the routes in Southeast Asia, West Asia, and Africa, to make it easier to bring in raw materials and maintain cost. Investors in the project are seeking out iron-ore mines and planning to build integrated steel mills nearby. Chinese steelmakers are anticipating a move of almost 20 million tons of low-cost steel capacity to be moved to Southeast Asia, West Asia, and Africa by 2023. A majority of the construction demand will be for long product and steel pipe, to satisfy a large amount of rail and pipeline required. There are existing investments by Chinese Steel companies already underway in South Africa, Thailand, Indonesia, Laos and Sierra Leone. The OBOR also creates a massive potential for an upgrade to China’s steel industry, allowing the production of higher quality products. In addition to new, high tech mills, the expansion west will likely improve the quality output of less-developed manufacturers in the western parts of China. If China increases the overall quality of their domestic output, this will create opportunities to shift capacity of low-grade steel products to developing countries. This shift will also low for higher margins on low quality steel due to relaxed regulations and close proximity to raw materials. For those of us serving the steel industry, there is a host of opportunities that arise due to the migration of steel production throughout the region. For starters, there have already been a number of new mills and upgrades within China’s largest steelmaking groups over the past several years; with a few more on the way. As existing equipment is moved from coastal China along the route, there is no doubt that there will be a need for new castings, forgings, and hydraulics to keep production running smoothly and efficiently. It goes without saying that this is an extremely ambitious plan. The capital investment and manpower required to accomplish this feat are unheard of in the modern age; and with only a small percentage of the investment pledged to date, there is still a lot of work to be done. But to look back at the development of China over the past two decades, one can easily see that anything is possible. Even today, people who come here marvel at the accomplishments in transportation; from the thousands of kilometers of highway, the connectedness of the high-speed rail, and the addition of almost 100 airports in a span of just 5 years. 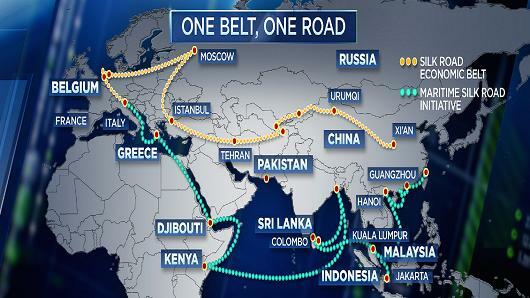 No one really knows how the One Belt One Road initiative will pan out. The potential to alter trade on such a massive scale is as exciting as it is frightening. Either way, there are exciting times ahead.